Famine has many broad definitions but there has never been one precise set of criteria to define whether or when a famine is occurring or has occurred. The general concept is that a severe and unusual food insecurity affects a large number of people in a manner that threatens large-scale loss of life. Dictionary definitions such as “extreme and general scarcity of food” (Oxford English Dictionary, 2017) do not give measurable parameters, which were lacking until relatively recently when the Food and Agriculture Organization developed a measurement scale. 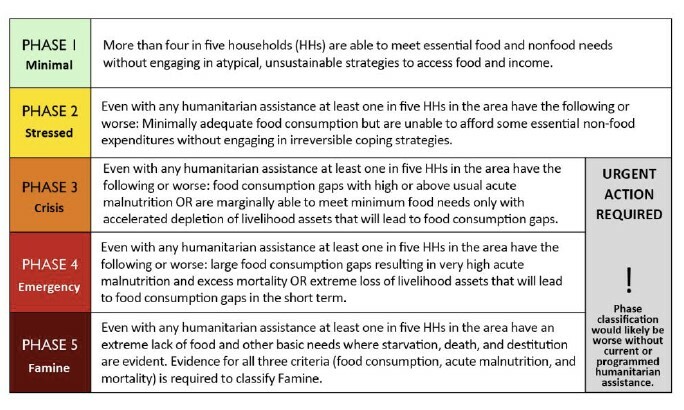 This scale, the Integrated Food Security Phase Classification (IPC), codes populations in a given geographic area according to five categories, or phases, with Phase Five being the worst (Figure 1). The IPC has brought important new rigor to defining famines and its usage has grown substantially since being originally applied to Somalia. Figure 1. IPC 2.0 Scale (FEWS NET, May 2017). Historically, “famine” has been applied to large populations over large areas. One would not speak, for instance, of one family suffering extreme food insecurity as constituting a famine. What then is the minimal threshold of people? That has never been defined. Authors instead have spoken of villages or small populations facing “famine conditions.” But intrinsic to the usage of famine is that it refers to a population in a given place. Therefore, even if large numbers of children are malnourished, resulting in death among many, across India for example, if the malnutrition is not concentrated in specific locations and intense over one period of time, it is not referred to as a famine. One would not say that a population has suffered or is suffering a famine when no large numbers of deaths have yet occurred. In the IPC framework, a famine is defined as Phase 5, and is declared when the following three criteria are met in a given area: at least one in five households face extreme food shortages, more than 30% of the population is acutely malnourished, and at least two people for every 10,000 die each day. Hence, the declaration of famine requires reliable and direct data on these three indicators: acute malnutrition, mortality, and food consumption (or a significant livelihood change). There are some challenges with the IPC system worth noting. In 2012, the UN declared the Somalia famine as officially ended, even though the rate of death still qualified as a disaster by international standards, the country still depended on food aid, and the rate of malnutrition remained the highest in the world. Thus, the IPC phase system allows a food insecure situation to be a disaster, even when not categorized as a famine. Much of the historic problem of determining when famines have occurred is due to the problem of good measurement, particularly where populations are very rural or in times of war. In situations where famine cannot be confirmed due to limited available evidence, a region may be declared at ‘elevated risk of famine’ if 2 (acute malnutrition, mortality) of these 3 pieces (acute malnutrition, mortality, and food consumption or livelihood change) of information are available (IPC Food Security Working Group, 2016). Famines typically occur only over extended periods of food insecurity. Famines do not usually occur in the first year of a food shortfall. The most severe effects on people typically occur in the second or third year of extended food insecurity. Famines are considered to be complex emergencies and therefore they have multiple, interrelated causes. Typically, famines have both direct, immediate causes and indirect, underlying causes. Yet famines are generally classified as being primarily due to either natural or manmade causes. There is considerable debate about this, as many humanitarian and development experts claim that modern famines are entirely manmade because they are primarily driven by political failures (Rubin, 2016). Historically famines have been thought of as being primarily driven by either natural or manmade factors (Mellor, 1987). In centuries past, famines resulted from local failures of food production. For most of history, when local food production failed, food could not be brought in from other regions or countries. A classic example of a crop-shortfall type of famine would be the Irish Potato Famine of 1845, where approximately one million people died of starvation and disease due to crop failure of the potato, Ireland’s staple crop (O Grada, 2007). The immediate cause of the famine was potato blight, which is estimated to have ruined one-third of the potato crops in 1845 and up to three-quarters of the harvest in 1846. During the 1800s, potatoes had become the main staple in the diets of the Irish people, particularly the poor. Although the primary cause of the Irish Potato Famine was blight, the potato crop failure occurred all over Europe and yet Ireland experienced a far higher mortality rate than any other country. The reason for the high death toll in Ireland relative to other countries is still widely debated today, but many attributed it to poor government response (Vanhaute, 2006). Figure 2. Rate of people dying due to famine per decade. Source: Our World in Data. Many experts are concerned that climate change may affect food security by increasing the spread of pests, changes in monsoons or other rainfall patterns, and desertification. While some areas may see increased food productivity under climate change, others may see declines. Poor governance and weak government institutions have long been associated with famine. 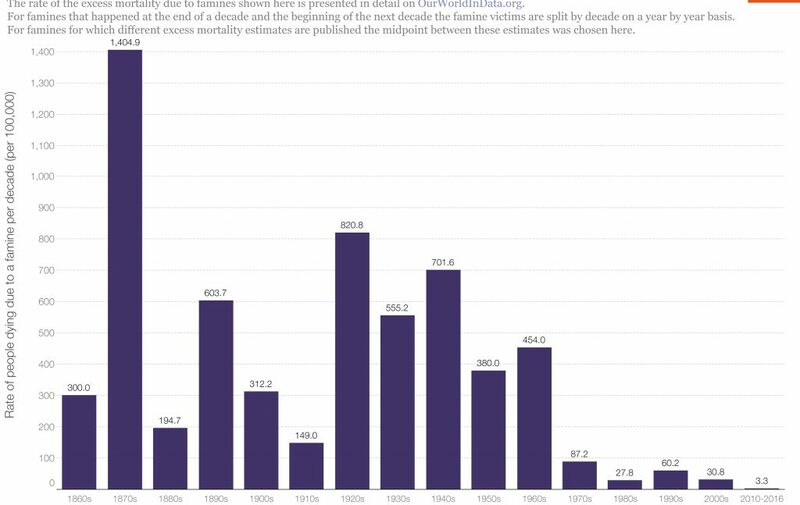 Experts have observed for instance that full-blown famines, with high rates of death, are not seen in democracies or countries with a free press. The primary manmade causes of famine are conflict and poor governance. Conflict is strongly associated with hunger and malnutrition (IFPRI, 2015). Armed conflicts have decreased globally but they have not been eliminated, as shown by the current wars in Syria, Yemen, and South Sudan, to name just a few. Modern conflicts are mostly civil wars, which tend to be lengthy, complicated, and difficult to resolve. Poor economic, social, and agricultural policies increase a country’s vulnerability to disasters by creating conditions of poverty and inequality (Mellor, 1987). Once a natural disaster or conflict occurs, the speed and effectiveness of the government’s response determines the evolution of a food emergency into famine (Mellor, 1987; Rubin, 2016). Early detection of food insecurity requires timely access to accurate information. This highlights the role of FEWS NET, or the Famine Early Warning System Network, a project created and funded by the U.S. Agency for International Development. FEWS NET continually monitors food security in key famine-prone areas of the world and provides public, transparent alerts. The goal is to detect early signs of food insecurity to prevent the occurrence of food crisis and famine. Effective ways to lessen famines are to reach areas early in the famine cycle, and provide them assistance before they are forced to sell their assets and migrate. Once people lose their belongings and uproot their families, it becomes very difficult for them to return. Therefore, programs that provide safety net support, including food-for-work for families suffering personal food insecurity, can help prevent famines and the distress migrations that occur. Humanitarian response to famine tends to be largely in the form of emergency food aid, which is often in the form of “rations” given to households. Because famines typically have multiple, complex causes, successful famine management requires a broad array of interventions. This may include providing adequate shelter, health services such as vaccines, access to clean water and sanitation, and agricultural support for subsistence households. In some cases, “emergency cash transfers” have been more effective in alleviating acute food insecurity than emergency food aid. There are currently four regions that are identified by aid agencies as experiencing acute food insecurity and in danger of famine: South Sudan, Northeast Nigeria, Somalia, and Yemen. According to the most recent IPC situation report, 17 million people in Yemen, approximately 60% of the total population, are experiencing severe food insecurity, with 6.8 million people classified under IPC Phase 4 “emergency level” food insecurity (IPC Phase 4) (FAO, April 2017). The primary driver of the Yemen hunger crisis is conflict and widespread civil insecurity, which has devastated both urban and rural livelihoods, leading to increased food insecurity, hunger, and severe acute malnutrition. The ongoing civil war between Shiite Houthi rebels and the former government which is allied with a Saudi Arabia-led coalition began in February 2015. Yemen has seen rising prices for food and fuel, decreased productivity in the agricultural and fishery sectors, blockage of imports at the ports and borders, and loss of jobs and income-earning activities (Yemen IPC, March 2017). To provide emergency relief to the affected households and regions, FAO has created a Humanitarian Response Plan for emergency provision of agricultural livelihood kits, emergency protection of animals, emergency support to improve and diversity income and livelihoods, and strengthening coordination of food security and agricultural response (FAO, April 2017). Figure 3. 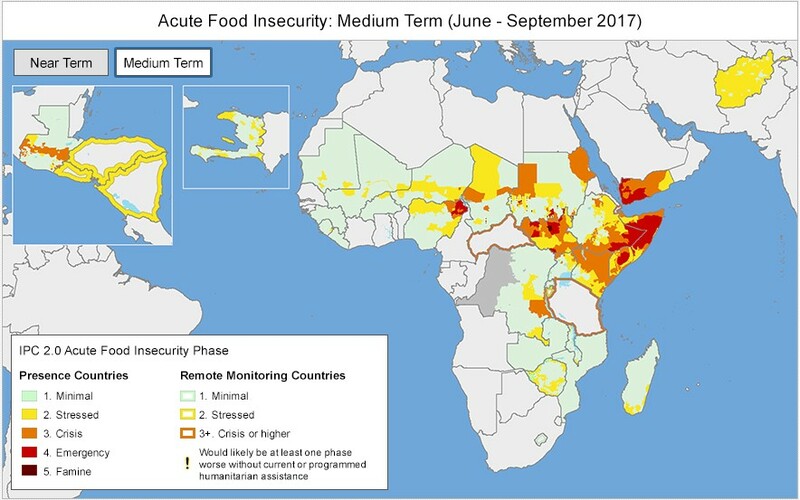 IPC Acute Food Insecurity Map: Medium Term, June – September 2017 (https://www.fews.net, accessed 5/31/2017). Al Haj, Ahmed. January 2017. Top UN Official: 10,000 civilians killed in Yemen conflict. Available online: https://apnews.com/43471432a8e949a7af6fc56928284d78/top-un-official-10000-civilians-killed-yemen-conflict. Accessed 5/30/17. Daoud, A., Hallerod, B., Guha-Sapir, D. 2016. What is the association between absolute child poverty, poor governance, and natural disasters? A global comparison of some of the realities of climate change. PLoS ONE 11(4): e0153296. Available online: http://journals.plos.org/plosone/article?id=10.1371/journal.pone.0153296. Accessed 5/25/17. Devereux, S. 2000. Famine in the twentieth century. IDS Working Paper 105. Available online: https://www.ids.ac.uk/files/dmfile/wp105.pdf. Accessed 5/27/17. Devereux, S. 2009. Why does famine persist in Africa? Food Security 1: 25-35. Available online: https://link.springer.com/article/10.1007/s12571-008-0005-8. Accessed 5/30/17. FAO. April 2017. Yemen – Situation report April 2017. Available online: http://www.fao.org/emergencies/resources/documents/resources-detail/en/c/882067/. Accessed 5/30/17. FAO. March 2017. Yemen needs urgent assistance to prevent famine. Available online: http://www.fao.org/news/story/en/item/522843/icode/. Accessed 5/30/17. Feikin, D.R., Adazu, K., Obor, D., et al. 2010. Mortality and health among internally displaced persons in western Kenya following post-election violence, 2008: novel use of demographic surveillance. Bulletin World Health Organization 88: 601-8. FEWS NET May 2017. Cholera outbreak grows; potential for disruption to Al Hudaydah ports remains a concern. Available online: http://www.fews.net/east-africa/yemen. Accessed 5/30/17. FEWS NET. May 2017. Overview of the Integrated Phase Classification 2.0. Available online: http://www.fews.net/IPC. Accessed 5/21/17. Food Security Information Network. March 2017. Global Report on Food Crises 2017. Available online: http://www.fao.org/fileadmin/user_upload/newsroom/docs/20170328_Full%20Report_Global%20Report%20on%20Food%20Crises_v1.pdf. Accessed 5/21/17. Howe, Paul. 2010. Archetypes of famine and response. Disasters, 34(1): 30-54. Available online: https://www.ncbi.nlm.nih.gov/pubmed/19624703. Accessed 5/21/17. International Food Policy Research Institute. 2015. 2015 Global hunger index: Armed conflict and the challenge of hunger. Bonn Washington, DC and Dublin: Welthungerhilfe, International Food Policy Research Institute, and Concern Worldwide. Available online: http://www.ifpri.org/publication/2015-global-hunger-index-armed-conflict-and-challenge-hunger. Accessed 5/21/17. International Food Policy Research Institute. 2016. 2016 Global hunger index: Getting to zero hunger. Bonn Washington, DC and Dublin: Welthungerhilfe, International Food Policy Research Institute, and Concern Worldwide. Available online: http://www.ifpri.org/publication/2016-global-hunger-index-getting-zero-hunger. Accessed 5/21/17. IPC Food Security Working Group. November 2016. Guidelines on key parameters for IPC famine classification. Available online: http://www.ipcinfo.org/fileadmin/user_upload/ipcinfo/docs/IPC_Famine_Guidelines_Nov16.pdf. Accessed 5/21/17. Leaning, J. and Guha-Sapir, D. 2013. Natural disasters, armed conflict, and public health. New England Journal of Medicine; 369: 1836-42. Available online: http://www.nejm.org/doi/pdf/10.1056/NEJMra1109877. Accessed 5/25/17. MacKenzie, D. 2016. Haiti faces famine and disease in aftermath of hurricane. New Scientist Daily News, 10 October 2016. Available online: https://www.newscientist.com/article/2108640-haiti-faces-famine-and-disease-in-aftermath-of-hurricane/. Accessed 5/25/17. Mellor, JW and Gavian, S. 1987. Famine: causes, prevention, and relief. Science 235: 539-545. O Grada, Cormac. 2007. Ireland’s Great Famine. University College Dublin Press: Dublin, Ireland. Oxford English Dictionary Online. March 2017. Oxford University Press. Definition for famine, n.
Rubin, O. 2016. Contemporary famine analysis. SpringerBriefs in Political Science. Available online: https://link.springer.com/book/10.1007%2F978-3-319-27306-8. Accessed 5/25/17. Schmidhuber, J. and Tubiello, F.N. 2007. Global food security under climate change. Available online: http://www.pnas.org/content/104/50/19703.full.pdf. Accessed 5/21/17. Slavin, P. 2016. Climate and famines: a historical reassessment. WIREs Climate Change 7: 433-47. Available online: http://onlinelibrary.wiley.com/doi/10.1002/wcc.395/abstract. Accessed 5/21/17. United Nations, General Assembly Security Council. March 2013. Sexual violence in conflict: Report of the Secretary-General. Available online: http://www.un.org/en/ga/search/view_doc.asp?symbol=S/2013/149. Accessed 5/25/17. Vanhaute, E, Paping, R, and O Grada, C. 2006. The European subsistence crisis of 1845-1850: a comparative perspective. IEHC Helsinki. Available online: http://www.helsinki.fi/iehc2006/papers3/Vanhaute.pdf. Accessed 5/25/17. World Food Program. February 2016. El Niño, drought blamed as severe food insecurity doubles in 6 months in Haiti. Available online: http://www.wfp.org/news/news-release/el-nino-drought-blamed-severe-food-insecurity-doubles-6-months-haiti. Accessed 5/25/17. Yemen IPC Technical Working Group. March 2017. Yemen IPC acute food insecurity brief: March – July 2017. Available online: http://www.ipcinfo.org/fileadmin/user_upload/ipcinfo/docs/IPC_Yemen_AcuteFI_Situation_March-July2017_ENversion.pdf. Accessed 5/30/17.